Hey man, Love your little creations you have! I am overly organized and I find this projector app to be an amazing app. Thanks! I knew people would use it! Glad to hear it. Let me know if you think of some good icons to add in the future. Yeah I was thinking I needed one for audio myself. I will look into more renders folders as well. I think Katie who had commented on some of these posts may have already made a C4D icon so I might check with her to see if she has one available, but I am sure I can get one put together. v2beta is in progress. How does this sound? 1. 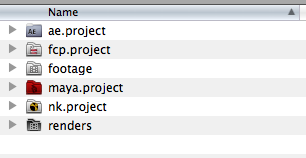 Create a new project folder with nothing in it. 3. Choose from a list the folder types you would like to create. With multiple selectable. 4. Hit OK and and all the folders you need will be created with the proper icons. Sounds damn good to me, and 1-3 are good to go, just need to find a way to create folders with icons and avoid having to go through the Get info process. Fingers crossed it is possible. . . It is and its up and running perfectly. Look for v2 sometime this week. hey, awesome! looking forward to it. Great app! super helpful. also how did you get that little layout bracket on the right side of your screen, keeping all of you icons separated? That is actually just a clever desktop wallpaper I put together and matched it to the grid spacing I like in the snap to grid feature on the OS X desktop. I have always wanted an app that would let me have something like that dynamically. May look into it with some friends some day though. . .